I am here today to let you know about the injustice that is going on in Benton Harbor, Michigan. Our city has one of the highest levels of poverty and unemployment in the country. Benton Harbor’s population is made up of Blacks, Hispanics and poor whites of which 94% are black, 90% live below the poverty level and 70% are unemployed. This is the location of the Whirlpool Corporation Headquarters and of U.S. Representative Fred Upton, who is the heir to the Whirlpool family fortune. My husband the Rev. 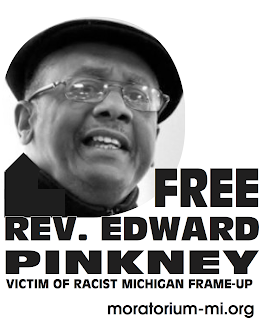 Edward Pinkney, one of the beloved leaders in Benton harbor, was put in prison for organizing against the Whirlpool Corporation, U.S. Representative Fred Upton, and its lynching judges Alfred Butzbaugh and Dennis Wiley. 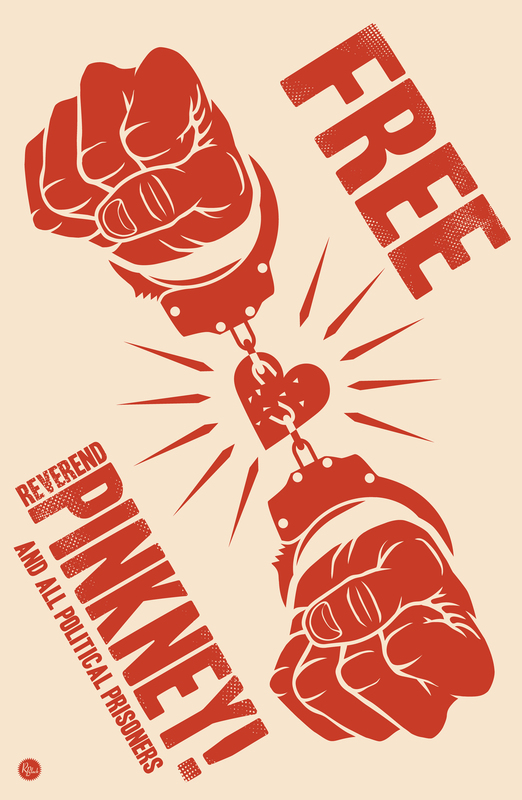 He was sentenced to 3 to 10 years in prison for quoting the Bible verse `Deuteronomy 28` about what God shall visit upon the iniquitous. Whirlpool, U.S. Representative Fred Upton and Judge Dennis Wiley used this quote in an attempt to silence my husband, but he is not a man to be silenced. Beware you could be next! This original charge stems from a successful recall of a corrupt city commissioner in a effort to stop Whirlpool, Harbor Shores, Cornerstone Alliance, and U.S. Representative Fred Upton from stealing prime lake front property, our very own Jean Klock Park, the only beach along Lake Michigan that was given to the citizens of Benton Harbor by John Klock. Whirlpool, Harbor Shores Developers and U.S. Representative Fred Upton want to steal the land to develop a 750 million to 1 billion dollars development known as Harbor Shores. My husband, a true black community leader and activist, has led the fight against official corruption and corporate greed in his impoverished and beloved community of Benton Harbor. It is the only city in the United States where Black’s own lake front property. He is a political prisoner only because he had the spirit to take on Whirlpool and U.S. Representative Fred Upton, a known racist. My husband is under house arrest 24/7. The police come by everyday to check on him even though he wears a G.P.S. tether. He cannot preach in a church or speak in any church, but they cannot stop him from speaking or preaching at home. My question to the people is; why should Governor Jennifer Granholm help Whirlpool and U.S.Representative Fred Upton steal our lake front land? Also, why will the Michigan Democratic Party let her or any other public representative support Whirlpool against the people of Benton Harbor? Our lakefront is being stolen for the development of a playground for wealthy people. We Need Your Help! The Democratic Party has always claimed itself to be the party of the people. Then when will they begin to protect our rights? Join the campaign to stop Whirlpool, Harbor Shores, and U.S.Representative Fred Upton from stealing our public lake front park and land and removing all blacks from the city of Benton Harbor. Join us in boycotting Whirlpool. DO NOT SUPPORT HARBOR SHORES!